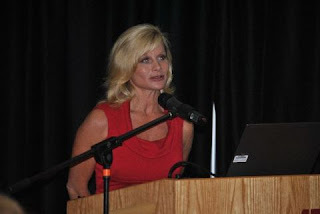 Tuesday, May 1, Ayers Foundation President - Janet Ayers - was invited to be Keynote Speaker for the first Reagan Giving Circle Scholarship luncheon at Austin Peay State University in Clarksville, TN. The Circle awarded scholarships to ten young women who are students at APSU. In her Keynote address, Ayers spoke about two of her life passions - Giving back, and education. She cited Bible scriptures Luke 12:48 and Jeremiah 29:11, speaking about responsibility and hope. "Good management is not doing things right, but doing the right thing!" said Ayers. "From a business perspective, it is imperative that community and business are intertwined in order for either to thrive and grow." she continued: "The Reagan Giving Circle embodies the spirit of individual giving, leveraged by the strength of many women focused on a common purpose. THAT is a powerful combination." The luncheon also honored retired Dean of the College of Business, Dr. Carmen Reagan. Reagan served as an educator for thirty years, and was the first female Dean of Austin Peay's College of Business. Dr. Reagan began her teaching career in Mississippi in the late 1960's and joined the teaching staff of Austin Peay in 1988. She quickly became known for her wisdom, intellect and warmth. Dr. Reagan has had significant impact on the Clarksville community through her service on various boards and her philanthropy.